Building Intelligent Agents is unique in its comprehensive coverage of the subject. The first part of the book presents an original theory for building intelligent agents and a methodology and tool that implement the theory. 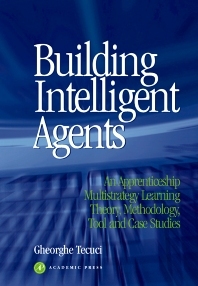 The second part of the book presents complex and detailed case studies of building different types of agents: an educational assessment agent, a statistical analysis assessment and support agent, an engineering design assistant, and a virtual military commander. Also featured in this book is Disciple, a toolkit for building interactive agents which function in much the same way as a human apprentice. Disciple-based agents can reason both with incomplete information, but also with information that is potentially incorrect. This approach, in which the agent learns its behavior from its teacher, integrates many machine learning and knowledge acquisition techniques, taking advantage of their complementary strengths to compensate for each others weakness. As a consequence, it significantly reduces (or even eliminates) the involvement of a knowledge engineer in the process of building an intelligent agent. First-year graduate courses in machine learning and AI; graduates, researchers, and students involved in developing intelligent agents; practitioners, particularly in the military where there is a lot of work going on in developing large software training simulations containing agents. Preface. Intelligent Agents. General Presentation of the Disciple Approach for Building Intelligent Agents. Knowledge Representation and Reasoning. Knowledge Acquisition and Learning. The Disciple Shell and Methodology. Case Study: Assessment Agent for Higher-Order Thinking Skills in History. Case Study: The Statistical Analysis Assessment and Support Agent. Case Study: Design Assistant for Configuring Computer Systems. Case Study: Virtual Agent for Distributed Interactive Simulations. Selected Bibliography of Machine Learning, Knowledge Acquisition, and Intelligent Agents Research. Notation. Subject Index. Gheorghe Tecuci is Professor of Computer Science at George Mason University and a full member of the Romanian Academy. He has had around 100 scientific papers published, and is best known for his contributions to multistrategy learning and integrated machine learning and knowledge acquisition.